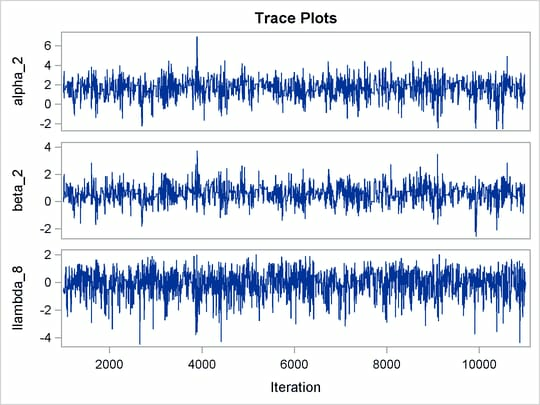 The PROC MCMC statement specifies the input data set (Pump), the output data set (Postout), a seed for the random number generator, and a simulation sample size of 10,000. The program requests that only trace plots be produced, disabling all posterior calculations and convergence diagnostics tests. 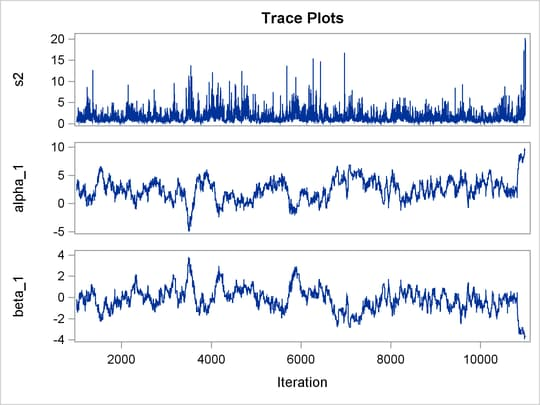 The ODS SELECT statement displays the trace plots, which are the primary focus. The first ARRAY statement declares an array u of size 2 and names the elements alpha and beta. The array u stores the random-effects parameters alpha and beta. The next ARRAY statement defines the mean of the multivariate normal prior on u. 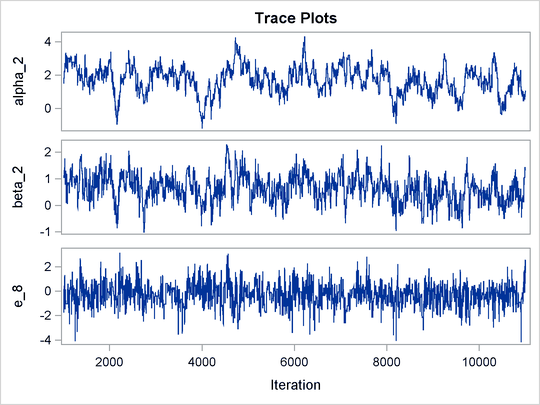 The PARMS statement declares the only model parameter here, the variance s2 in the prior distribution for the random effect . The PRIOR statement specifies an inverse-gamma prior on the variance. The first RANDOM statement specifies a multivariate normal prior on u. The MVNAR distribution is a multivariate normal distribution with a first-order autoregressive covariance. When the argument rho is set to 0, this distribution simplifies to a multivariate normal distribution with a shared variance. The RANDOM statement also indicates the group variable as its subject index and monitors all elements u. The second RANDOM statement specifies a normal prior on the effect e, where the subject index variable is pump. The MONITOR= option requests that PROC MCMC randomly choose one of the 10 e random-effects parameters to monitor. Next, programming statements construct the mean of the Poisson likelihood, and the MODEL statement specifies the likelihood function for each observation. 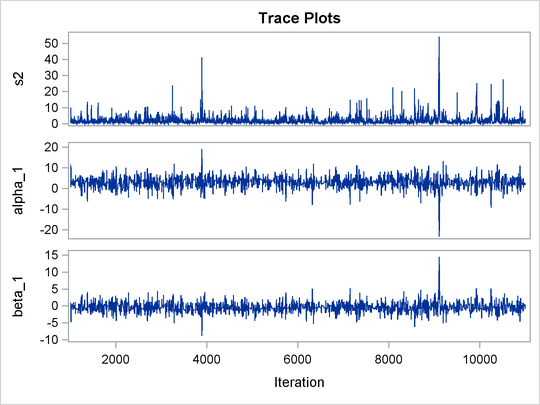 Output 73.8.1 shows trace plots for . You can see that the chains are mixing poorly. The difference between these statements and the previous statements on is that these statements have the variable w as the prior mean of the random effect llambda. The symbol lambda is the exponential of the corresponding (llambda), and the MODEL statement assigns the response variable y a Poisson likelihood with a mean parameter lambda, the same way it did in the previous statements. 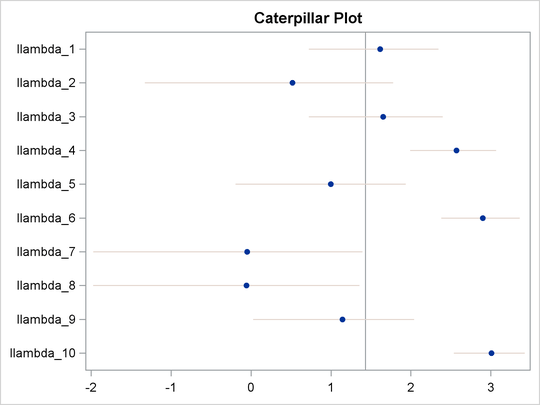 The trace plots of the monitored parameters are shown in Output 73.8.2. The mixing is significantly improved over the previous model. The posterior summary and interval statistics tables are shown in Output 73.8.3. Varying llambda indicates nonconstant dispersion in the Poisson model.